Over the past few months, we’ve been gaining a better understanding of how Mars’ subsurface, surface, and atmosphere interact and affect the presence of water ice in the northern plains of Mars. While doing landing site analysis for the Phoenix Lander, we noticed bright spots standing out in visible CRISM images of the relatively bland terrain of the northern plains. 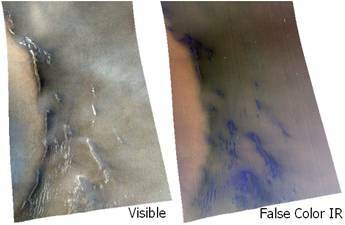 In false color infrared composites, the spots appeared very bright blue and had a distinct absorption at 1500 nanometers that is indicative of water ice. I decided to find out if these deposits were just in this one region around the Phoenix landing site or if they were more widespread around the whole northern plains. Unfortunately, it was the very end of summer in Mars’ northern hemisphere by the time I noticed these deposits and we didn’t have time to acquire many high resolution targeted observations before the sun started to set for polar winter. 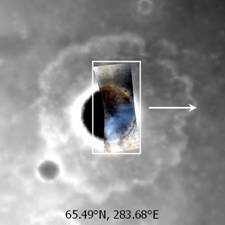 We did get one very good image late in the season that shows an unusual water ice deposit on the outside southeast-facing rim of a crater (below). 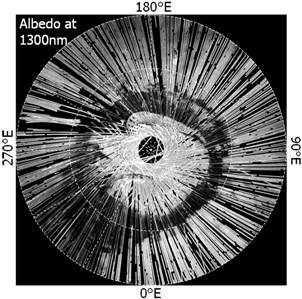 While waiting for the next opportunity to acquire targeted observations, we began looking more closely at polar observations taken by CRISM in multispectral mode. 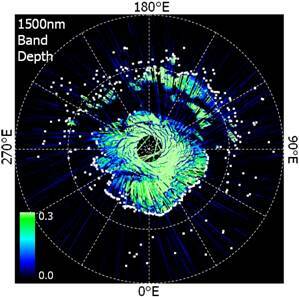 Looking at a 360-degree view of the north polar region, down to a latitude of 65 degrees, I examined each degree of longitude, and marked the southernmost occurrence of water ice in each (shown in the left image below as a white dot; the blue and green colors indicate band depth at 1500 nm). You can see all the little dots trace the outline of the residual polar cap, but the interesting ones are those that appear far from the cap. 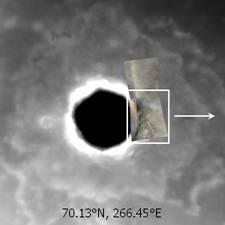 We immediately asked ourselves, why are these ice deposits where they are? Is there something controlling them? The most obvious thing we noticed about these “outliers” of ice is that most seem to be on the north-facing slopes of craters and other elevated topographic landforms. That means they’re in shadows, which makes sense because shadows are cooler than surrounding areas. But of course we also found some exceptions to that, in ice deposits that are downwind, or on the leeward side of the craters. The first set of images above is an example of this case. Tim Titus at the USGS in Flagstaff and some of his students are now looking for those same spots in data collected by the Mars Global Surveyor’s Thermal Emission Spectrometer (TES) and the Mars Odyssey’s Thermal Emission Imaging System (THEMIS). The spots are evident in the data from those instruments, but with CRISM we get much better resolution and they are often easier to spot. By comparing the data from all three instruments, we can get a better idea of the conditions that create these outliers of water ice. We presented our combined research at the Lunar and Planetary Science Conference this March in Texas. We’ve also found a correlation with the general albedo of the polar region. We simply don’t see these water ice outliers in the darker regions, which tend to absorb more of the sun’s heat and are warmer than bright areas. Regional topography seems to also be a factor, but I think this is related to the global trend of higher elevations on Mars being brighter because they are net depositional areas for dust. Even though the northern plains are low-lying and very flat overall, we still see that same trend in albedo—the elevated parts of the plains are generally brighter than the lower parts. The last thing I looked at was how these water ice outliers related to Gamma Ray Spectrometer data from an instrument on the Mars Odyssey spacecraft, which shows the estimated depth to the ice table. In the polar regions, the ice table is very shallow—kind of like permafrost on Earth. The polar cap ice is on the surface, but the farther from the pole you go, the deeper the ice table gets. We can see that the surface ice outliers occur in areas where the ice table is very shallow. This probably means that similar factors, such as albedo, are controlling both the ice outliers and the ice table depth. Now that we’re heading again into the northern summer season, the carbon-dioxide ice seasonal polar cap is receding. 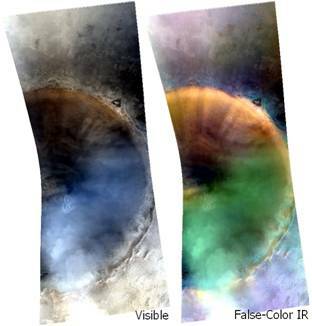 The false-color image below (left) was acquired January 11, 2008 and reveals both water and carbon-dioxide ice on the surface in different concentrations. The sunlit sides of the crater and dark dunes in the bottom are warmer and have less carbon-dioxide ice. The dunes and bright areas around the rim in the visible image (right) are where the water ice is most abundant. The hazy looking area in the southwest part of the crater (bluish in the visible, greenish in the false-color infrared) is a cloud! We will continue to monitor ice deposits like this one throughout the spring and summer to observe the dynamics between the different ices and their atmospheric, surface, and subsurface environments. Understanding these interactions will help us figure out how water has shaped the landscape of Mars throughout its history.